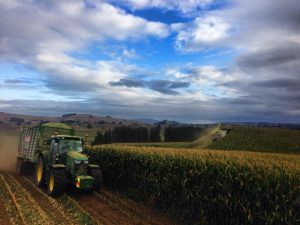 Harvesting and processing your Maize Silage is the key factor in ensuring you get the most out of your Maize. Kernels need to be cracked or smashed to ensure your stock is able to breakdown and utilise them efficiently. Our John Deere Self Propelled Forage Harvesters are equipped with Kernel Processors that are able to smash even the hardest kernel into 5+ pieces. The processor also helps break down the maize stalk, ensuring that the ensilaging process can occur quickly. With the use of the John Deere GPS systems, we are able to tell you instantly what the moisture and yield of your crop is. The machine can also automatically adjust its cut length (IVLOC – Infinitely Variable Length of Cut) on the run, and is adjusted to match the moisture of your crop. The Forager is able to produce a detailed yield map of your crop paddocks, which is then downloaded and supplied to you at the end of the Harvest Season, to help identify key areas in your fields that may require special attention in order to maximise your yields. We are also equipped with certified weighbridges, so you can trade your crop and both Customers know exactly what they are getting. 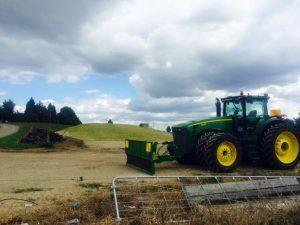 We work with Hills laboratories to give comprehensive Silage test results so you are able to work out exactly what you have in your stack and how to correctly utilise it.